អំពីអង្គការ – Welcome to Peace Bridges! Who is Peace Bridges ? Peace Bridges is a capacity building organization dedicated to helping others develop peace building and the necessary organizational skills to design, deliver and evaluate peace programs. Peace Bridges Organization seeks to form and sustain vision, values and skills for non-violent communications in strategically placed peace builders who can spread the vision, values and skills throughout their circles of influence starting with their families and close community relations, yet spreading through wider circles of influence in their churches, communities, and organisations. 1. Equip peace builders from partner groups to be capable of offering basic conflict prevention education and/or conflict counseling and mediation. 2. Mobilise those we train to work in cooperation with Peace Bridges as peace educators and/or mediator/conflict counselors. This includes working within and beyond their own organizations contexts in partnership with Peace Bridges. 3. Develop training and resources relevant to violence prevention interventions aimed at reducing incidents of violence in families, between youth and general communities. 4. By 2015 build a sustainable, local NGO, with international links, under the directorship of a Cambodian national and majority national staff. 1) identification of partners and relationship-building for mutual trust and benefit; 2) selection and training of key peacebuilders from partner organizations, including commitment by partners to peace programming; 3) mobilization and continued support from Peace Bridges’ staff to help tailor peace programs to partner-specific contexts and provide resources and co-trainers. Because Peace Bridges is committed to maximizing the impacts of peace resources within Cambodia, our focus is on building long-term, strategic relationships with other organizations and committed peacebuilders. Before training begins, we work with partners to explore why and how peace programming may be useful in their context, as well as staff that could most benefit from long-term training. Supervisor support and clearly identified changes in job responsibilities to include peacebuilding are two keys to our partnership successes. • include multiple units that • meet once a month • in 3.5 day units (this allows travel from the provinces to Phnom Penh) • and include homework and reflection journals between sessions to apply and reinforce learning. Training is dialogical, participant-centered and is designed to impact all four learning domains (Knowledge, Attitudes, Skills, and Habits). Training is based on the conviction that personal transformation of peacebuilders is essential in building effective community programs. Peace Bridges currently offers three long-term training programs. Part A, Empathetic Listening & Conciliation Training, is a 5-unit foundations course introducing key concepts in peace theory and communication. Part B, Conflict Resolution and Transformation Skills, is a 6-unit advanced training focused on third party interventions using mediation and conciliation skills. Part C, Peaceful Families & Family Reconciliation, is a 6-unit advanced training focused on reducing family violence and building family reconciliation skills and processes. Each course also includes an 1-unit training in either Training of Trainers (for facilitation skills) or Planning, Monitoring & Evaluation of Peace Programming. 1) Type 1 Partners: the peacebuilder is primarily interested in using peace training in their individual work. For example, we have trained many counselors at anti-trafficking organizations who use their skills to build more effective relationships with their clients. 2) Type 2 Partners: the peacebuilder is involved in providing peace training and/or services within their organization. For example, we have trained human resource managers and team leaders who use their skills to train others in their organization or to provide mediation/conciliation services to co-workers in conflict. 3) Type 3 Partners: the peacebuilder is involved in providing peace training and/or services within their wider community. This can be through integrating peace training into existing programs OR by creating new programs. For example, we have trained NGO workers who expanded a literacy program in the provincial prison to include basic peace training and communication skills; another peacebuilder started a community support group for families struggling with conflict and violence. Additionally, Peace Bridges offers 2-day meetings of a Peacebuilder Alliance 3 times a year for all graduates. One day is spent in sharing stories, listening to challenges, and encouraging one another. 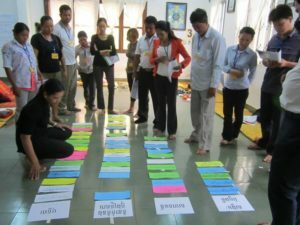 The second day is spent in providing new training relevant to peacebuilding in Cambodia. This unique, 3-stage approach has meant that Peace Bridges is able to support creative and high-impact peace programming throughout Cambodia, even with a very small staff. Our partners come from many sectors and we are committed to continuing this approach of helping all organizations integrate peace programming into their work – from agriculture to HIV/AIDS prevention, from religious education to community development, from human rights defenders to local authorities.